The new FLIR LS-Series thermal imaging camera gives every law enforcement officer the power to see clearly in total darkness. It can be used for many applications. These new models are integrating the latest FLIR uncooled detector technology optimized for offering extra long distance detection performance. The FLIR LS-Series are extremely affordable units. From now on, every law enforcement officer can be equipped with thermal night vision. Price is no longer an issue. There is no longer a need to use a less effective night vision technology. The FLIR LS-Series are equipped with an uncooled, maintenance free, microbolometer detector. It delivers crisp thermal images in any day or night situation. The FLIR LS64 produces thermal images of 640 x 480 pixels. Users that do not need this high resolution can choose for the LS32 which produces images of 320 x 240 pixels. All cameras are equipped with advanced internal camera software that delivers a crisp image without the need for user adjustments. The FLIR LS64 is equipped with a 35 mm lens. It allows detecting human targets at a distance of no less than 1,080 meters. The FLIR LS32 is equipped with a 19 mm lens that allows detecting a human target at a distance of 640 m.
The FLIR LS32 comes with a 2x digital zoom. The FLIR LS64 is equipped with a 2x, 4x digital zoom and continuous electronic zoom. Weighing 340 grams, batteries included, the FLIR LS-Series are extremely compact and extremely light systems. They are ideal for go-anywhere operations, in all circumstances. They are IP67 rated and operate between -20°C and +50°C. Ergonomic and easy-to-use, FLIR LS-Series thermal imaging cameras are fully controlled with the buttons on top of the unit. Conveniently placed the buttons are all right underneath your fingertips. 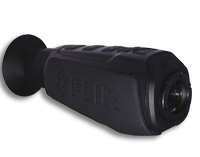 Both versions of the FLIR LS-Series come with an integrated laser to quickly and safely pinpoint suspects in the dark. The FLIR LS-Series comes with long-life rechargeable Li-Ion batteries. The FLIR LS-Series has a typical operating time of 5 to 7 hours on a single load. The unique InstAlert feature colors the hottest part of the scene red. This makes it easy to spot suspects in the thermal image.